Space shuttle Endeavour lofted another Tracking and Data Relay Satellite into orbit for NASA during a January 1993 mission. An Inertial Upper Stage boosted the craft toward geosynchronous orbit. Other highlights from STS-54 included a mobility-testing spacewalk and an educational project to demonstrate the physics behind toys in space. The crew narrates this post-flight film. The Laser Geodynamics Satellite (LAGEOS), a small ball-shaped spacecraft designed to help earthquake research by monitoring the movements of the Earth's crustal plates, was launched from space shuttle Columbia in October 1992. The crew of STS-52 narrate the highlights of the mission, which included Canadian and microgravity experiments. In advance of launching the Expedition 15 mission to the International Space Station, NASA officials preview the flight's objectives and challenges in this news briefing held March 27 at Johnson Space Center. As the International Space Station's Expedition 14 winds down, officials managing the flight from Mission Control in Houston hold this retrospective briefing to talk about the mission. The 50th flight of the space shuttle took place in September 1992. Endeavour's mission featured the Spacelab-J research module for Japan, as well as the first black female astronaut and the first married couple to fly together in space. The crew narrates the highlights in their post-flight film. Shuttle Atlantis' summer 1992 flight provided the chance to test a revolutionary payload -- the Tethered Satellite System. A snag in the tether prevented a small satellite from reeling miles away from the shuttle as planned, the partial deployment showed power generation using the shoelace-size tether could work. The STS-46 mission also released the European Retrievable Carrier spacecraft to begin a year-long stay in orbit. The astronauts narrate highlights from the flight in this movie. During an unprecedented solar eruption last December, researchers at Cornell University confirmed solar radio bursts can have a serious impact on the Global Positioning System (GPS) and other communication technologies using radio waves. The findings were announced Wednesday in Washington, D.C., at the first Space Weather Enterprise Forum�an assembly of academic, government and private sector scientists focused on examining the Earth's ever-increasing vulnerability to space weather impacts. Solar radio bursts begin with a solar flare that injects high-energy electrons into the solar upper atmosphere. Radio waves are produced which then propagate to the Earth and cover a broad frequency range. The radio waves act as noise over these frequencies, including those used by GPS and other navigational systems which can degrade a signal. NOAA, NASA and partner agencies in the National Space Weather Program are looking to the future needs of our highly technical society, and are anticipating seamless specification and prediction of the atmosphere from the ground to the edges of the Earth's magnetosphere and beyond to the Moon and Mars. The NOAA Space Environment Center is the nation's first alert of solar activity. "Space weather cuts across many different federal agencies and is a particularly fruitful area in which to develop sustained partnerships between government agencies and academia," said Brig. Gen. David. L. Johnson, U.S. Air Force (Ret. ), director of the NOAA National Weather Service. "We are, and will continue, to work together to keep the public ahead of nature's storms." 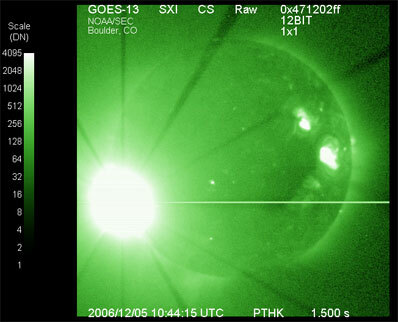 Forecasters from the NOAA Space Environment Center in Boulder, Colo., observed two powerful solar flares on December 5 and 6, 2006. These violent eruptions originated from a large sunspot cluster identified by NOAA. On December 6, 2006, a solar flare created an unprecedented intense solar radio burst causing large numbers of receivers to stop tracking the GPS signal. Using specially designed receivers built at Cornell University as sensitive space weather monitors, Cornell scientists were able to make the first quantitative measurements of the effect of earlier solar radio bursts on GPS receivers. Extrapolations from a previous moderate event led to the prediction that larger solar radio bursts, expected during solar maximum, would disturb GPS receiver operation for some users. "In December, we found the effect on GPS receivers were more profound and wide spread than we expected," said Paul Kintner, Ph.D., professor of electrical and computer engineering at Cornell University. "Now we are concerned more severe consequences will occur during the next solar maximum." "This solar radio burst occurred during the solar minimum, yet produced as much as 10 times more radio noise than the previous record," said Dale Gary, Ph.D., chair and professor of the physics department at New Jersey Institute of Technology. "Measurements with NJIT's solar radiotelescope confirmed, at its peak, the burst produced 20,000 times more radio emission than the entire rest of the sun. This was enough to swamp GPS receivers over the entire sunlit side of Earth." The Global GPS Network, a set of precise GPS receivers used for a variety of scientific and real-time applications, also was affected by this solar disturbance. These applications include a very high accuracy positioning service that can provide a user's position with 10 to 20 cm accuracy anywhere in the world, on land, in the air or in Earth's orbit. "NASA wants to better understand this solar phenomenon so we can limit the adverse impacts on real-time systems," said Tony Mannucci, Ph.D., principal technical staff and supervisor, Ionospheric and Atmospheric Remote Sensing Group at the NASA Jet Propulsion Laboratory. Additionally, researchers at Boston College found the December 6 event was the first time a solar radio burst was detected on the civil air navigation system, Wide Area Augmentation System, or WAAS. "Although our findings indicate the effects of this solar burst were less intense on WAAS than on other operational systems, mainly due to the robust system design, it is important for us to consider the potential impact of future, more powerful, solar radio bursts during periods of high solar activity," said Patricia Doherty, co-director and senior scientist, Institute for Scientific Research at Boston College. There are three key points to remember about solar radio bursts. "First, society cannot become overly reliant on technology without an awareness and understanding of the effects of future space weather disruptions," said Anthea Coster, Ph.D., MIT Haystack Observatory. Second, the December 6 event dramatically shows the effect of solar radio bursts is global and instantaneous. "Third, and equally important, the size and timing of this burst were completely unexpected and the largest ever detected. We do not know how often we can expect solar radio bursts of this size or even larger."